Who wouldn’t be interested in a few recommendations that might just speed along a natural delivery? No guarantees, but it is definitely worth a try. These vitamins are extremely helpful for preparing your body to go into labor, getting the cervix and uterus ready to go. I used these faithfully in preparation for my first delivery. I think there is no doubt that they were very helpful for me. I had a pretty smooth six hour labor, which is often unheard of for a first pregnancy. I can’t say for sure, but I am highly suspicious that these supplements were key to my early (Karis arrived at 39 weeks) and shorter delivery (considering my mom’s first delivery was 21 hours)! Dr. Christopher’s Pre-Natal Formula - this is a 6 week formula to be taken in the last six weeks before your due date. You start by taking one a day the first week and increase to two the second week and so on, until you are taking six a day in the last week. It is formulated to aid in giving elasticity to the pelvic and vaginal area and strengthening the reproductive organs for easier delivery. My mom swears by these vitamins as she took them with her last pregnancy and low and behold the twins arrived in 2 hours! This formula contains: Squawvine Herb, Blessed Thistle Herb, Black Cohosh Root, Pennyroyal Herb, False Unicorn Root, Red Raspberry Leaf & Lobelia Herb. Evening Primrose Oil – Evening primrose oil is an excellent source of prostaglandins, which readies your cervix for labor. My midwife and doula recommended taking this from 38 weeks on at 6 tablets a day (500 mg each). Choice a cold pressed version.Nature Made Herbs Evening Primrose Oil is available through Amazon. 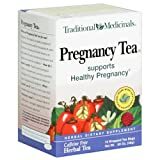 Red Raspberry Leaf Tea /Pregnancy Tea -Traditional Medicinals Organic Pregnancy Tea is the highest quality option I have found for getting a good supply of raspberry leaf. It is a delicious tea! They also sell a basic raspberry leaf tea as well. Red raspberry leaf tea is a uterine tonic used first by Native Americans. It tones your uterus and helps it do more effective exercising while you are pregnant. It does not “cause” contractions and can be safely used throughout pregnancy, although most seem to recommend waiting till 36 weeks before consuming raspberry leaf. It helps to tone the uterus after delivery as well, shrinking it back to size more quickly and reducing bleeding. It can also help strengthen cesarean scars. As the Dr. Christopher formula has Red Raspberry leaf, I usually just stick to the Prenatal Formula and Evening Primrose Oil in the final weeks before delivery. I have already ordered by stock for this second pregnancy and am ready to go here in a few weeks! We are at the 10 week countdown! As always, make sure to run these ideas by your doctor or health care practitioner before consumption. Hello – I have bookmarked this article for when I was ready to have my first baby. I am now 6 months pregnant and am looking to buy these supplements. I cannot find the Christopher’s prenatal on any of my supplement sites or the one linked above. Does anyone know if it was discontinued? Is there an alternative? Thanks! It has a new name: Birth Prep. I used this with my last 2 pregnancies and highly recommend it! I am 33 weeks with my second. I am planning on using Evening Primrose Oil to try to prepare my cervix a bit this time around. I bought the 4 oz. bottle from Mountain Rose Herbs, however I am unsure how to measure out 500mg-2500mg like most people recommend, when the jar is just a bottle of oil. Can you help me with this? I would be so grateful. I have searched everywhere for this information and have yet to find anything. Hi Lindsay! I realize this is an old post but hopefully you see this I had a question for you about Dr. Christopher’s. You mentioned your mother used this with a twin delivery. I am currently pregnant with twins. My 1st daughter was a csection, my 2nd child (son) was a VBAC (yay!) and I thought this one would be too but my doctor is hesitant to do a twin VBAC. However, if a twin VBAC is a possibility, I would like to use Dr. Christophers as my VBAC with James was three days of active labor. Seriously. My question is this: because a twin pregnancy is considered full term at 36 weeks and most deliver then, would you start taking the suppliments at 30 weeks or start them like a normal pregnancy at 34? When did you mother start taking them for her twins? Thanks so much! No, I wouldn’t recommend starting them too early. Probably 32 weeks at the earliest. I cannot recall when my mom started them, but she also didn’t know she was expecting twins till 28 weeks. I love your blog, and have read so many that didn’t really seem to know what they are talking about…I recently created my own blog and aspire to your standards. Thank you for the quality articles! Hey, Lindsey…I’m going to order the Dr. Christopher’s and I’m wondering if 1 bottle is sufficient. For some reason my doctor told me not to take the Evening Primrose Oil. I need to ask her to explain more clearly why. Last baby I had my water broke before I even began to efface and after 8 hours of contractions I still hadn’t dilated even a little. Needless to say, I ended up being induced and had an epidural, but I have a beautiful, healthy little girl who is almost turning 1! I was thinking that the Evening Primrose Oil would be good to take because of my past experience to insure that my cervix would be “ripened” sooner! But she said no. Hmmmm….Thoughts? Unfortunately, you will need two bottles to cover you for the 6 weeks. It is rather silly that they don’t put the whole quantity needed in one bottle, so you are left with 1/4-1/2 bottle left…but I always save it for the next pregnancy. I would recommend talking with a Naturopath or midwife if you want more natural recommendations. One more question regarding the Pregnancy Tea. It’s starting to warm up here and I’m not craving hot liquids at all. You think it will still be as effective to make the tea iced or do I need to drink it hot? Drink it cold by all means! Also, is it true that its not good to drink coffee when your pregnant? I drank one cup a day with my last pregnancy but my husband mentioned not too long ago that he thinks maybe it’d be a good idea to start weaning myself off of it for this pregnancy, he heard it was bad for the baby? I’m curious as to why the dosage you took for the Dr. Christopher Prenatals was different from what is suggested on the bottle. I’m entering week 35 and have been taking them for the last week. According to the bottle, it is recommended to up the dosage to 2 pills the second week, but then to 2 pills 3 times a day from the third week on. Do you know why your midwives suggested you take it this way instead of what is suggested on the bottle? Yes, I was just following my midwife’s recommendations. You will find many times there are differing opinions on the use and safety of herbs. Dr. Christopher’s is a well known herbalist (one of the leaders of herbal medicine) and this formula has been around for a long time! My mom took it for many of her pregnancies. If any cause irritation, by all means, eliminate it, but that is not standard for all. These come highly recommended by my midwife, and they have never caused me any problems. I have had two wonderful births on these herbs! Yes, definitely! I just try to make sure I choose quality brands in order for them to be effective. Throughout your blog, you mention both Integrative Therapeutics and Dr. Christopher’s Pre-Natal Formula (for the last 6 weeks). Does that mean that you took both during your last 6 weeks or did you switch? Integrative Theraputics is my daily multi-vitamin/pre-natal, so I took that every day throughout my pregnancies. During the last six weeks I would add the Dr Christopher formula. So yes, I took both at the same time. Thanks for the heads up for the prenatal herbs! Sounds great and will hope to take it the next time around. I just wanted to add that I took red raspberry leaf tea with all 3 pregnancies and with the 2 VBACs that I’ve had, my labors were both over 20 hours long! But praying for a quick and speedy delivery for ya anyhow! I think these supplements are great. I used the evening primose oil in capsule form as prescribed by my midwife at the end of my pregnancy. I also used red raspberry tea regularly through my second and third trimesters. Despite this though I still went past 42 weeks and had to have my water broken to start labor. My labor was about six (very hard) hours but I had a healthy baby born at home who weighed almost 8lbs. I think some babies just need that extra time in mama to be ready to thrive outside. Also, Wise Woman Herbal for the Childbearing Year has been a really handy book for me. It is natural remedies for pregnancy symptoms, labor, post-partum, new baby, and everything in-between. Like I said, I found it very helpful. There was one page on inducing miscarriage that I ripped out, and she is pretty relaxed about somethings (medicinal use of marijuana) as a caution. I have never heard of the Dr. Christopher Pre-natal Formula before, but it sounds great. Even though my labors have been cut in half each time(12hrs, 6hrs, 3hrs), I would still like to take it because I had natural hospital births and they used pitocin(which is awful), This time I am going to a birthing center and having a water birth. Anyways, I guess you have already ordered yours but you can get them cheaper at http://www.vitacost.com/Christophers-Pre-Natal. I always check with vitacost, because they are usually cheaper. Thanks so much for the advice. Yikes! I’d better steer clear of these if we do have more children. My husband and I have been blessed to have all 4 children naturally and they have come progressively faster, with our first coming after just 3 hours. (I start considering it labor when it becomes uncomfortable/painful.) We barely made it to the hospital with my 3rd and 4th. Thank you for sharing so much valuable information with us! Thank you for sharing this! I never heard about raspberry leaf, I keep it in mind if I am blessed with another child! My first labor was very long and painful, but I am so thankful I could finally have my daughter naturally. Do the pregnancy tea or raspberry tea have caffeine in them? No…they are both caffeine free. And when I went thru my Bradley class, my instructor insisted on what’s called cervical softening! I did have to go through c-sections, and have nothing against them. Longer recovery period, but I knew when my baby was coming! As far as yearly exams, they are a most. There is no other tool to detect cervical cancer. I started at 16, mainly because my cycles were so bad. My ob is the best, he’s gentle, and I come out of there w/all my questions answered. And if breast cancer is in your family, like mine, you can get a mammogram earlier than 40. I started getting them at 30. And doing a oil massage to the perineum is also suggested to help prevent tearing. Another great thing for hubby to do! I love the Mama’s Red Raspberry Brew from bulkherbstore.com- a trustworthy, Christian source. I made a pitcher often and drank it throughout my pregnancy. Buying in bulk like this is much cheaper than those individual tea bags-just a tip for next time around perhaps! I also used primrose oil in the last few weeks. I just inserted a gelcap at bedtime. It must have worked- I was at a 3 and completely effaced by 39 weeks! Baby came 5 days early, with an 8 hour labor. (my first baby) Praise the Lord! Thanks for sharing these. I hadn’t heard anything about dosage for evening primrose oil. I did know that some people apply the oil topically to the cervical area. Also, I’ve been upping my raspberry tea, I’d been wondering if I was too late. It’s good to know that I’m at a good spot for drinking lots of it (I’m four weeks out). I’ll have to ask my midwife about Dr. Christopher’s. It sounds like a great resource! I’m scared about going too far past my due date and being risked out of a homebirth. Do you know where you can get it? I’ve also been recommended to take good probiotics and eat a lot of fermented foods to make sure that the good cultures in the birth canal are at optimum strength to pass on to the baby. It really is fascinating how all that works. I have so much to learn. Please keep the information coming! For the Dr. Christopher vitamins, check out the link above or here. I personally prefer swallowing the evening primrose oil as a tablet rather than liquid form applied to the vaginal area, although that is definitely another option. Since you are just 4 weeks out, I would definitely recommend you just go with the raspberry tea and evening primrose oil this time around. I would say regular exercise has to be one of the best “herbs” you can take. You are sending blood to the area and strengthening the muscles used for delivery. Less chance of injury for mother and baby and quicker healing. My first labor was 5 hours, completely natural, if I count feeling a little off at supper. My mother’s first was 26 hours ending in the use of forceps. My main exercise was walking. It also greatly decreases the chance of back labor. With my second I was decidedly out of shape though at a great weight. And I had such horrible back labor that I allowed a block which did not work and resulted in three months of post spinal migraines. I don’t say this is scare anyone, but to say exercise is free and as natural as can be and something God intended us to be doing. Think of women bending in fields cultivating crops. Our library has 1,2, 3 three mile walk videos to check out for free. PLEASE exercise and don’t only rely on supplements for a great delivery. It takes many things for the process to go as intended. Isn’t the countdown too long and too short all at once? :^) Not long before you can hold your blessing in your arms! I wholeheartedly agree! Exercise is extremely important and would definitely be the other item I would recommend for a more speedy delivery. I exercised consistently during my first and now into my second. Exercise and eating healthy are both high on the list, I just didn’t include them as I have addressed them previously. For an exercise video during pregnancy, I recommend Denise Austin’s Fit and Firm Pregnancy as reviewed here. Thanks for all of the information, it’s great to know what’s out there. However, I would like to point out that in the UK raspberry leaves are considered to be unsafe in the first three months of pregnancy. I use it to ease period cramps and my packet states on the side that the tea can cause abortions under three months, but is recommended after that to prepare for labour. Other than that, I hope to get pregnant when I get married, and I will be trying out you recommendations! Yes, that is why I stated that there seems to be some debate about the raspberry tea. I had heard that it can possibly lead to miscarriages in the first trimester as well and thus best to wait to consume until you are into the second or third trimester. Lindsay, I can’t believe you only have 10 weeks to go! Ironically, I am only 10 weeks IN!!! I am bookmarking this post for use sometime around late June I am due in August with our first. Having a long labor is one of my fears, I suppose it’s only natural. Thanks for the tips!! Oh, I forgot to ask, Lindsay, I know you use a midwife… do you also use an OB? I would love to hear some opinions on using OBs and the practice of getting yearly checkups, etc. I am in serious prayer about this next pregnancy we’re hoping will happen soon. We have a lot of decisions to make. Thank you. Thanks for the recommendations! We are currently ttc our 3rd child, and I want to go a much more natural route this time around. I wish I had known 2 babies ago what I know now! Will be thinking of you as you sail through the next 10 weeks. Thanks for being a blessing! I’ve always drank the tea throughout my pregnancies- I think I remember learning it helps prevent misscarriages. I only drink one cup a day during 1st trimester, 2 during second & 3 during last trimester. I am very interested in the red raspberry leaf tea! I am not currently pregnant (but hoping!!!) and I had a c-section with my first daughter. I very much desire an unmedicated, natural birth if I am blessed to have another child. I have been told by my OB that most women just opt for repeat sections for ease, scheduling and safety. Safety especially if there is less than 2 years between pregnancies. My daughter is 9 months and I am hoping for less that two years. I like the fact that it strengthens c-section scars, which is the reason that my doctor leans toward repeat c-sections….the integrity of the uterus. I love your blog! You are very inspirational and make me aspire to be a better wife, mother and homemaker! Hi. Thank you for sharing this info. I have personally used Red Raspberry Leaf Tea and attest that it does help with having a faster delivery. With my first pregnancy I didn’t have any pre-labor contractions went over the due date and ended up having to be induced and had 12 hours of labor. With my second daughter I had pre-labor contractions and had 7 hours of labor without any medications or being induced and had the baby 6 days before the due date. I drank a cup of tea a day up until the last week of pregnancy and then drank a quart a day. I will definitely use the tea again if God blesses us with another baby. I pray you have a quick, healthy delivery. I have a friend who took Red Raspberry tablets in the same manner as the supplement you described with all 4 of her pregnancies. If I’m remembering the numbers correctly…all of her natural births were very easy and under 6 hours start to finish! I’ll continue to pray for you to have a healthy remainder of your pregnancy and a quick, easy labor and delivery!